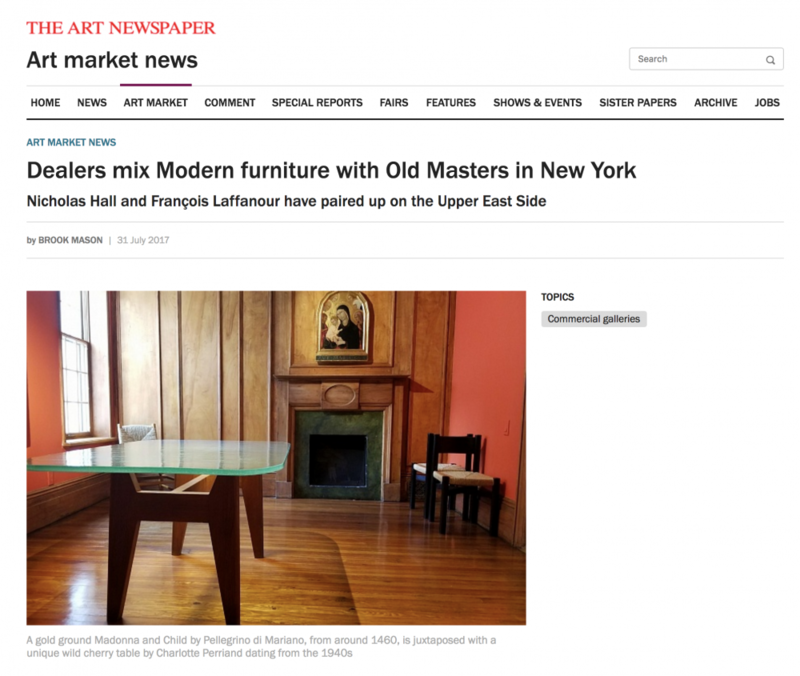 The New York-based Old Masters dealer Nicholas Hall, who previously served as the international chairman of Christie’s Old Masters and 19th-century department, is now collaborating with the Parisian mid-century design gallerist François Laffanour. The pair are showing Modern furniture alongside European Master paintings and sculpture in the top two floors of a townhouse just step away from the Carlyle Hotel on Manhattan’s Upper East Side. “I now have more than a dozen American clients who are collecting both 20th- and 21st-century design,” Hall says of the cross-period purchasing. “It’s all part of a growing trend.” He points to the architect Peter Marino, whose holdings of Italian and French Renaissance sculpture were featured in London’s Wallace Collection in 2010, as having an enormous influence on collectors. “There has been a decided ripple effect,” Hall adds. At the gallery, a gold ground Madonna and Child by Pellegrino di Mariano, from around 1460, is juxtaposed with a unique wild cherry table by Charlotte Perriand dating from the 1940s. “To me it’s important to show my holdings in a new light and Old Masters with Perriand as well as Pierre Jeanneret make the perfect conversation,” says Laffanour, who has placed design pieces in the collections of MoMA and the Metropolitan. “If I could afford it, I would own a Piero della Francesca and a Botticelli and place them along side the high points of French Modernist design in my own home,” Laffanour says. Hall continues the collaborative spirit next autumn, when he is working with the Modern and contemporary art fealer David Zwirner to stage an exhibition devoted to 500 years of art. “That’s just another way I am reaching out to collectors,” Hall says.